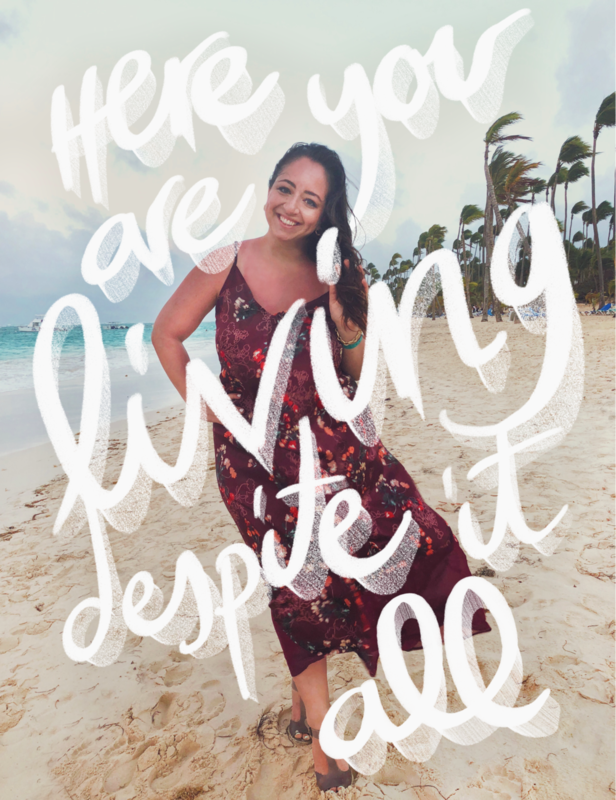 "And here you are living despite it all"
Rupi Kaur's single line of poetry relates struggle of a spoonie in the simplest of ways. It's not corny, it's not exaggerated, it's just plain true. We are all here, alive, moving forward... at whatever pace it may be, regardless of the cards we've been dealt. What a simple and empowering statement. Yet it should not be interpreted that living is merely enough... we shouldn't settle for just being alive. Because we are alive, anything is possible. I've lived nearly half of my life with a chronic illness. 14 years of waking up and feeling pain someplace or everyplace on my body. Most days I rally and rise, go to work and out with friends, try my hand at physical fitness and clean my apartment. Some days I lie motionless because the physical pain is too much to bear or the mental exhaustion is overwhelming. As a spoonie, it's the balance of both of these kind of days that is necessary for my success as a person. At the beginning of my fight I was 50/50. Half good days, half bad. For a while I was fine with that. For every fun day I had out of bed... going to high school like a regular kid, I had one down day to watch Oprah and eat frozen cookie dough (yes, Oprah was still on air). And by fine with it I mean I was pretty damn depressed but chalked it all up to teenage angst — and I was a teen who actually had something real to be angsty about. A year into my battle I started wanting to stay home even on days I felt okay enough to go out. The reality of being in pain forever had hit me hard. This is who I was and who I'd always be. I obsessed over thoughts of never being normal and how my illness would make me less than everyone else. I had been diagnosed with Fibromyalgia and this strange new word became as important as my own name was to me. If someone were to ask me who I was at that time, I would have immediately thought of my illness and not of my talents and passions and goals. I look back now and realize I placed limitations on myself simply because I was sick and not because I truly couldn't accomplish something. I'd immediately assume I wasn't able to climb three flights of steps rather than try to and fail. I was afraid of proving myself right, facing the reality that I was a young woman with a disability. Declaring that "I can't" was on my own terms, giving me a sliver of control over the pain. Do I blame myself for handling my condition this way? Absolutely not. It took me a long time to notice that my pain wasn't always in my way — I was. Here I am at 29 years old, fourteen years after my original diagnosis, with the addition of a few other conditions and plenty of experience with the ups and downs of having a chronic illness. My symptoms sometimes limit me but I have a limitless life. It's limitless because I no longer hold myself back from experiencing things out of fear that my pain might stop me. Whether I'm trying a new exercise with my personal trainer or committing to a work assignment, I say yes before my body says no. It's important to listen to your body, but hey, at least give it a chance to speak.